I love a challenge. Some of the most fun I’ve had making tea is when someone asks me to recreate a taste, or try making a tea with something I haven’t worked with before. 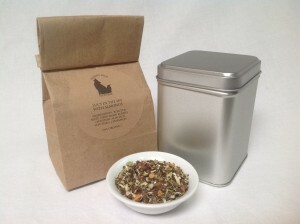 My little brother is setting up to open a brick and mortar tea shop in Canada, and he wanted to have a signature shop blend. Given how many of the random things I’ve come up with since we started Desert Sage Natural he has enjoyed, he asked me to blend it for him. The primary challenge came from the fact that I had only tasted this particular tea twice, once under his supervision. I had to learn the tea before I could make a tea with it as the foundation. I ran a number of tests with the base blending tea, varying brew strengths, and came up with a couple of ideas. We made one with almonds, and one with walnuts. Even as I was experimenting with them, I was pretty sure the walnut version was the one he would want, and from the tests… I was perfectly happy to keep the almond version for Desert Sage Natural. The taste of this tea is very much the sum of the parts. Almond is a delicate taste, and in this blend it is a subtle addition to the overall taste profile. As with all our ‘Simply Tasty’ teas, this one does offer health benefits, as well as the sheer enjoyment of drinking a good tea. Mate is another source of anti-oxidants, as your standard teas are, with the additional benefits of being a traditional digestive aid and cardiovascular tonic. Hawthorn gives even more support to the heart and cardiovascular system (and tastes good.) Eleuthro (Siberian Ginseng) is a stimulant stronger than caffeine, and also an adaptogen. It gives the body more capacity to deal with stress and daily wear, over persistent use. 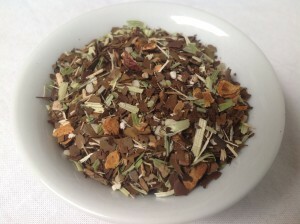 However, it is also one of the more potent herbs that I deal with, and is one I always feel I must balance. Oatstraw is a soothing herb, full of vitamins and minerals, and has a particular strength in helping to deal with stress and the wear and tear of the pace of modern life. Almonds help the heart, they have compounds that are anti-cancer, and … well, there’s a lot more about this particular nut and I want to keep this briefer than a tea-novella. 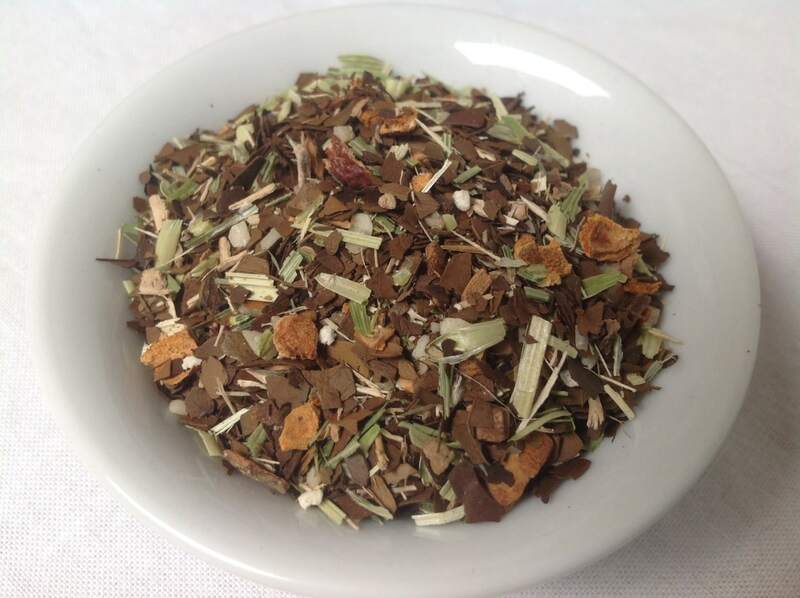 Cinnamon’s primary medicinal purpose in this tea was to act as a catalyst, to bring all the effects to bear faster. Additionally, it is a mild painkiller, and another herb that helps with heart health. Cinnamon does lead to a caution with this tea, however. Cinnamon is a variable strength blood thinner. If you are on prescription medication for blood-thinning, please check with your doctor before regularly drinking this tea. Additionally, there are medications that do not interact well with Eleuthro, primarily for immune diseases. ***I am not a doctor. The FDA (and a myriad of other agencies) have not decided that any of this is fact. While we draw on science as well, for the most part, even when there is research indicating the efficacy of herbs, they have not been formalized as treatment methodologies. Thus this information is not intended to diagnose, treat, cure, or prevent disease from a medical standpoint. This entry was posted in Mate Tea, Nuts, Simply Tasty Teas and tagged Desert Sage Natural, Energizing Tea, Music Tea, Organic Almond Tea, Organic Almonds, Organic Cinnamon, Organic Eleuthro, Organic Hawthorn Berries, Organic Oatstraw, Organic Roasted Mate Tea, Organic Siberian Ginseng, Simply Tasty Teas by DesertSage. Bookmark the permalink.